If your home has been the victim of an unfortunate water leak, learning how to fix water damage on a floor will help save you hundreds of dollars in repair and refinishing costs. Because water damage affects every type of flooring, from hardwood and laminate flooring to vinyl tiles, using the right repair technique for the right flooring is the key to bringing your floors back to life. Linoleum or vinyl tiles are some of the least expensive flooring solutions available and because they are among the easiest types of flooring to clean and maintain, they are commonly found in bathrooms and kitchens. However, being used in wet locations such as these also increases the risk of the tiles suffering from water damage, especially if the water is not soaked up immediately. One of the advantages of linoleum and vinyl tiles is the ability to replace the tile or tiles that are exhibiting damage; there's no need to tear up the entire floor. Start by scoring the damaged tile with a utility knife or vinyl tile cutter. Use a scraper to get underneath one side of the tile and start prying it up. If the tile breaks, don't worry about it. Once you get the affected tiles out, scrape all the old adhesive off the floor and clean out all of the debris. Wash the floor down with warm, soapy water and a clean sponge. Let the floor try completely and double check for adhesive or debris. Depending on the type of tile (self-adhesive or glue-down) you have, install it as directed. Use a roller to ensure the tile makes a good bond with the floor. If you are installing a glue-down tile, clean the edges of the tile, wiping up any adhesive that came through the seams. Water and hardwood flooring don't mix. Over time, water can produce unsightly black or white stains on the floor. Here's how to fix water damage on a floor laid with real wood planks. Use painters tape to outline the affected area. Remove the top layer of wax using steel wool, then change over to 80- or 60-grit sandpaper to remove the surface finish, gradually changing grits until you reach 100-grit paper. Sand the wood all the way up to the edges of the tape and clean up the debris when done. Take one cup of hot water, add oxalic acid crystals (available from your local hardware store) and stir until the crystals dissolve. Continue adding crystals until they no longer dissolve. Apply the solution to the affected area and allow it to dry. Once dry, wipe up the crystals and apply another coat of the solution. Continue this process until the stain is completely gone. Follow the instructions and safety information on the bottle of oxalic acid crystals. Wear protective gloves and eyewear when using this product. Stain and seal the affected area so it matches the color of the flooring around it. Laminated flooring comes packaged with claims that it is water resistant, but don't let that fool you; if water sits on the flooring long enough, it will buckle. The biggest problem with repairing a laminated floorboard is getting it out. The boards are locked together in a tongue and groove fashion; in order to replace the area that's buckling, the floor needs to be pulled up from the nearest wall to the affected area. Remove the quarter-round trim along the perimeter of the wall nearest the buckled area of flooring. Using a small pry bar will help make this an easier process. Since laminated floors are "floating" they do not get installed flush to the wall; there should be a small gap between the plank and the wall. Pull up the planks until you reach the affected area and clear away any water damaged planks. 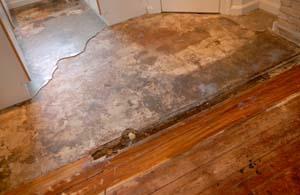 Make absolutely sure that there is no residual water left on the floor or under the foam sheet. If water is present, place a dehumidifier near the area and allow it to fully dry before you lay the replacement planks. Install the replacement planks and return the original, unaffected planks back to their spots in the installation sequence. Re-install the quarter-round trim and the job is complete.